Set in pre-revolutionary Russia, in a time of intellectual enlightenment, with much importance placed on class, Long Way North is an animated adventure which captures the determination of one young woman of noble birth named Sasha who rejects society's expectations of her in order to forge her own path. 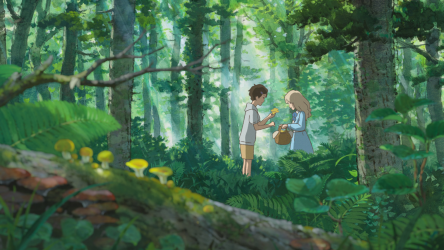 Visualised using traditional 2D animation with a predominantly pastel palette, the colour choices evoke the breaking of dawn, hinting at change and new beginnings, while also lending the film a nostalgic and gently coloured image of the past. Film has provided a platform for young people to fuel their curiosity about the wider world, inspired by tales of globe-trotting adventurers and their discoveries. Challenging the borders of the known world is a human fascination that goes back to ancient times, as seen in Jason and the Argonauts, where Jason, aided by the goddess Hera, takes to the seas with his crew aboard the Argo to travel unexplored lands and claim the golden fleece. Historic voyages of exploration that shaped our understanding of the globe are a rich topic for film, with reinterpretations of expeditions involving a clash of cultures such as the English pioneers discovering the 'New World' of North America in Pocahontas and the Spanish conquistadors seeking riches in Mexico in The Road to El Dorado. Animation has the ability to take the wonder of discovery one step further, creating visions that reflect the feelings of thrill and excitement felt by the explorers, as well as their apprehensions about leaving their known world behind. The voyage of Carl and Russell in Up, aboard a party balloon-elevated house, to the remote land he'd always dreamed of visiting is a joyous and surreal escape. The adventures of Maki and his giraffe in Zarafa take them from Egypt to France, by sea, land, and by using a new advancement in technology - the hot air balloon. Each leg of their journey is rendered in a different animation style to capture a snapshot of the reactions people have as they dazzle along their way. Sasha, the heroine of Long Way North, idolises her grandfather Oloukine, a dedicated explorer who was last seen setting out to be the first to reach the North Pole. Contact was lost during his journey, and Sasha is horrified to overhear that search efforts are being called off. Worse still, his last attempted voyage is considered a disgrace by the ruling class. Keen to restore faith in her family's name, Sasha defies convention by planning her own mission to find out what became of him. 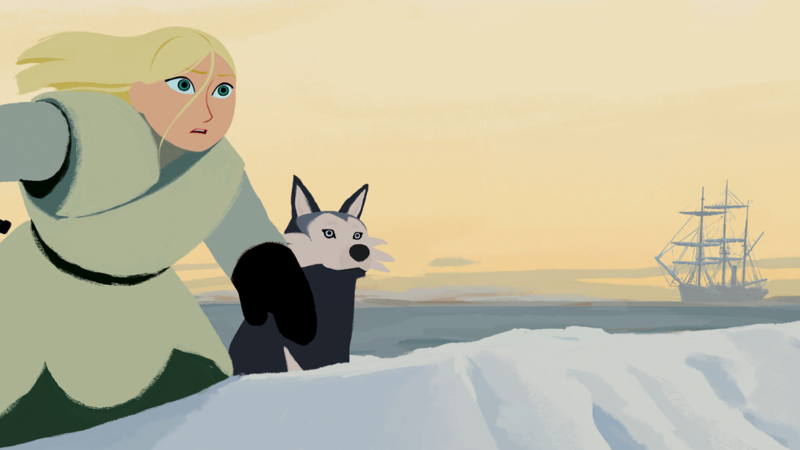 Long Way North follows in the trend of other children's films such as Anastasia or A Little Princess that have at their heart a feisty high-society heroine who has to live among people of a lower social class in order to achieve a personal mission (and learn something important about themselves along the way). The film reveals Sasha's view of the emptiness of what she left behind in comparison to what her new life of adventure can offer. Rejecting a world of fancy dresses, formal occasions, and speaking only when she's spoken to is not a hard choice for a girl who is fiercely curious and spends all of her time plotting to follow in her grandfather's footsteps and who causes concern to her parents by hiding out all the time researching in the library! Sasha rejects the etiquette of the traditional debutante ball in much the same way as other feisty protagonists Elizabeth in Pride and Prejudice or Merida in Brave, disrupting their parents' plans for a prosperous union with their rebellious natures. Instead of charming her high society peers with her elegance and obedience, Sasha seeks out people whom she hopes can help her, causing embarrassment to her parents. As soon as she realises that she is the only person who cares about the truth of her grandfather's fate, she slips out to the docks to find a ship that is willing to take her to the far North. Gaining passage isn't as simple as she thought however, and Sasha has to prove herself to her potential shipmates because of the up-til-now comfortable existence she has led. Mulan follows a similar path, also in the name of defending her family's honour, as she steps in to take her father's place at the battlefield. Though not engaging in combat or having to conceal her gender, Sasha takes a similar leap into the dangerous unknown that up until now her life has not prepared her for. Luckily, with the help of others who are keen to knock the 'fine lady' down a peg or two, and teach her the value of hard work, she quickly adapts to her new environment and shipmates - much like Elizabeth in Pirates of the Caribbean, whose fascination with seafaring life comes to her aid when she is kidnapped by pirates . Learning to be 'one of the boys' and earn her place in the crew is something that Sasha is happy to knuckle down and do, resenting implications about reduced capabilities due to her gender, much like the resourceful heroine in Wadjda. Depicting the frozen wastes of the pole beautifully, this film captures the fragility and danger of the environment, as seen for real in documentaries featuring footage of Captain Scott's doomed polar voyage, including The Great White Silence and Scott of the Antarctic. Defying the perils that threaten her and the rest of the crew, Sasha's determination and single-mindedness brings them into dangerous territory as they attempt to find evidence of the fate of the explorers that have gone before them, and try to ensure their own survival in the brutal landscape. 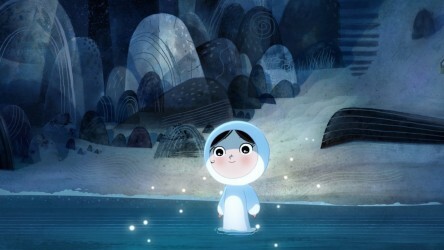 We take a look at the new breed of hand-drawn animations, led by Irish studio Cartoon Saloon. 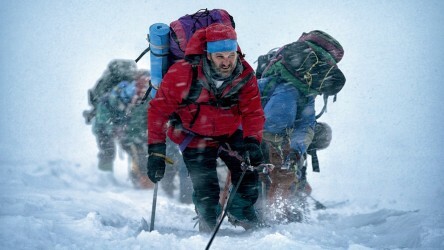 We're taking a look at Everest and other depictions of the world's tallest mountain, and exploring the rigours of filming at 18,000ft above sea level.